Multiple sclerosis (MS) is a nervous system disease which affects spinal cord and the brain. MS damages the myelin sheath. Myelin sheath is a term which exemplifies that material which surrounds and protects human nerve cells. Globally, high Unmet need of drugs for treatment of the disease, increased research in the field of MS to develop innovative therapies are the prime growth drivers of global Musculoskeletal Diseases market. 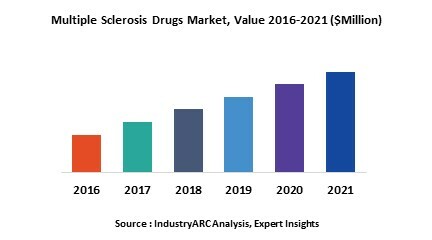 In addition, increase in adoption of Multiple Sclerosis Drugs in emerging economies such as China, India and others, will create new opportunities for global Multiple Sclerosis Drugs market. However, patent expiry of major drugs and advancement in biomedical science are the key restraints for global Musculoskeletal Diseases market. Geographically North America dominated global Multiple Sclerosis Drugs market, The U.S. represents the largest market for MS drugs followed by Canada in North America. In Europe, France, Germany, Italy, Spain and the U.K. holds major share of MS drugs market. However, Asia is expected to show high growth rates in the next five years in global MS drugs market. Among all the product types, Immunomodulators has the highest market share in global Multiple Sclerosis Drugs market. This report identifies the global pharmaceutical contract manufacturing market size in for the year 2014-2016, and forecast of the same for year 2021. It also highlights the market drivers, restraints, growth indicators, challenges, and other key aspects with respect to global pharmaceutical contract manufacturing market.